August is the Month of Blogging! Even though I’ll be in Germany for nearly a week of this month I’ve decided to take part in a blogging initiative called Blaugust. It’s mostly being done by game bloggers. Because I write about games for my day job I don’t often write about them for myself. But I’m going to dedicate at least 1/3 of this month talking about games. And I’m not counting the time I’ll be in Gamescom because that is just something totally different. So I suppose the big question to start off with is, what am I playing these days? I miss the days when friends didn’t have to ask what game I was logged into they knew exactly where to find me. 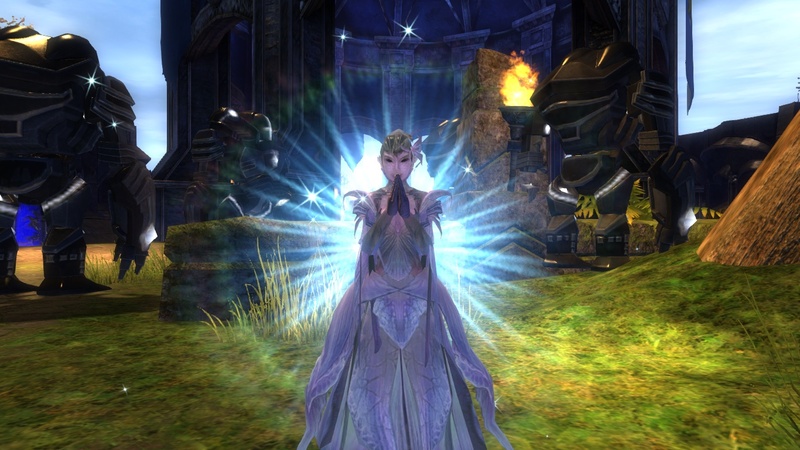 I had that for a good run in Guild Wars 2 but the Scarlet story was just so bad. And it wasn’t like you could just ignore it. So after suffering through months of crappy stories, farming for loot all day, and not getting to do our own stories Jonathan and I walked away. We came back again about two weeks before Season 2 started. We kept playing right up to the weekend before Episode 2 and then just stopped again. I keep meaning to go back, we’d like to see how the story is going. I’ve not heard anything but great things about it. We just…haven’t. I also played an R2 Game called Shadowbound for an upcoming review on MMORPG. Spoilers: it is terrible. As an industry standard it is an unofficial rule that you should at least play up into the 20s level range. This, in theory should give you a good idea of what the game is like. I got to 20 in that game in less than a half hour. Needless to say I had to keep playing. I was barely out of the tutorial at that point. Anyway, I won’t spoil the rest of the review for you. You’ll just have to keep an eye out for it on MMORPG in the next couple of weeks. Red GM text says: We need to clean the floors so we are unpluging the servers. Why am I taking part in Blaugust? I always start out these sorts of things then end up not finishing them. I’ve tried to do NaNoWriMo for several years now, there was a Blogathon I wanted to take part in a few years ago that seems to have just disappeared. I suppose the only thing I’ve ever actually completed like this is Extra Life. I’ve done it three years in a row. But I’m not going to do it this year. While I’d love to continue to take part they’re no longer supporting hospitals outside of North America. And sure, there are international hospitals in North America that treat kids from all around the world, but it really is hard to get support for somewhere that is an entire ocean away. So fundraising is difficult. That being said, it wouldn’t take a whole lot to convince me to take part. There have already been a lot of requests for the City of Heroes team to return, and I have been the leader of that. So…maybe you’ll see me here asking for donations sometime soon. This entry has been day 1 of the 31 day blogging initiative Blaugust. If you’d like to find out more about it, read blog entries from others, or join in you can find out more information by going to the initiative’s page on Anook. It might have something to do with playing during European hours on a North American server also. But yeah, most of the people who I played with at the start have moved on. Ahh yeah, I played on US server on FFXIV, and I ended up feeling very alone after a while. Last time I go US server, wish they were just merged so I could play with my US friends.